On The Blacklist Season 6 Episode 16, the Task Force investigates a woman who targets gambling addicts while Red tests the loyalties of his associates. On The Blacklist Season 6 Episode 15, Aram makes a move against Red while the Task Force got closer to finding out the truth about Anna McMahon. On The Blacklist two-hour event, Red takes part in a treasure hunt, but the fun is forgotten when a sinister organization hunts for Samar. Emotional, anyone? On The Blacklist special two-parter, Red finds the end of a rainbow, but are we seeing the end of Samar? Check out the photos and decide for yourself! The Blacklist centers on James Spader as Raymond "Red" Reddington. For years, he was on the FBI's Most Wanted list, only to broker a deal with the agency that allows him to work with agents in order to track down other big-time criminals across the world. 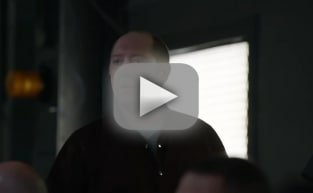 Red mostly works with Elizabeth "Liz" Keen (Megan Boone) to capture and sometimes kill these bad guys, all of whom are on the FBI's Blacklist. Red aims to teach Liz to think like a criminal and see the bigger picture... whether she actually wants to or not. The Blacklist also star Diego Klattenhoff ("Homeland"), Harry Lennix ("Man of Steel"), Amir Arison ("Girls") and Mozhan Marno ("House of Cards"). Flying is life. Falling is death. Permalink: Flying is life. Falling is death.